Auberge L'Apero is located just five minutes from two metro stations connecting to the rest of central Montreal, putting it 'within walking distance of a lot of attractions/shops', according to Hostelworld guests . We like that this clean, friendly hostel offers free breakfast until the afternoon, making it ideal for travellers looking for a lie-in. Many visitors have told us they'd recommend this hostel to friends and would stay again. Very corporative staff. I always choose this place to stay. Its really good place. Great value and central location in downtown. Great Staff and atmosphere! Location is in the heart of downtown and the cheapest in Montreal. only one tiny issue to be realistic, hot water is not available all the time. Everything else is excellent in this hostel. Very good location for the price!! Kitchen is always open which is good if you wanna cook after going out. Staff is nice and helpful, the atmosphere is ok. The cleanliness is mostly good. Overall still a very nice experience in a small hostel downtown. You won't find better value for your money. 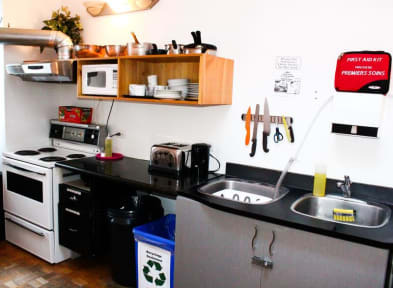 This hostel is right beside Concodia university, a 5 minute walk to the downtown core, and an easy walk from one of the 747 bus stops coming from the airport. The owners/managers are super helpful over email and they reply very quickly. The dorm room is a dorm room, but very clean. Lots of bathrooms. You are provided with a lockable locker. The hostel also provides breakfast. The only area that is a bit lacking was that the shower was lukewarm. -> Free locker & key as standard. -> You can rent a towel for only $1. -> 20 mins to Parc du Mont-Royal, 30 mins to Vieux Montreal (walking). -> Power outlets are a little sparse. -> Free breakfast is pretty standard for a hostel, all you could want. Secure, clean and well-located. A great place for a trip to Montreal. Good: Amazing location, good value for money, a variety of breakfast Bad: Saggy matress, rude personal, only one really bright light, no sockets close to the bed and warm water only to certain times (I was standing under a cold shower and the girl at the reception didn't even know when the hot water would be back). Pros: cheap, adequate kitchen space, rooms were fine and free lockers Cons: NO warm water. No one else was showering, and I allowed the water to run for 3 minutes and it just did not warm up. I had to shower in ice cold water on a day below freezing. Also, the hostel itself was kept very cold. The rooms were no frills, and the price was good. Receptionist was not very welcoming at all. I would not stay here again. However it is very cheap. Do not stay if you plan on showering. There is no warm water to wash and the stuff is not friendly, not enough space and people who you don't know what exactly are they doing here! !